Posts Tagged "dangerous by design"
13 Americans per day were struck and killed while walking by drivers from 2008-2017, according to a report released today by our colleagues at the National Complete Streets Coalition. Dangerous by Design 2019 also shows how some of the most dangerous states are, astonishingly, committed to making the problem even worse. Between 2005 and 2014, a total of 46,149 people were struck and killed by cars while walking. That averages out to about 13 people per day. This fall, our colleagues at the National Complete Streets Coalition will release Dangerous by Design 2016, a report that will again rank the nation’s most dangerous places to walk using the Pedestrian Danger Index. This year’s report will dive deep into how income, race, and place play an outsized role in how likely people are to be killed while walking. And they’re looking for your help when it comes to illustrating just how bad it can be out there. You may not have known it — its not the most publicized special day on the books — but today is National Walking Day. Some of you may have traded part or all of your drive or transit trip today for a walk to work. But for many, every day is walking day, and it happens on streets with dangerous or inconvenient conditions that no one should have to endure just to walk to school, their job, or the grocery store. NY Governor Andrew Cuomo’s decision to sign complete streets legislation is a step forward for pedestrian safety, though a Times report out of Orlando yesterday illustrates how much further we have to go. 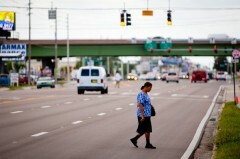 The status-quo for most people on foot or on bike around the country is woefully unsafe and insufficient, though perhaps nowhere more so than in Florida. Many of you were shocked by the story of Raquel Nelson, the single mom in Atlanta charged with vehicular homicide when her son was killed while crossing an unsafe street with her. While shocking, head-scratching stories like hers are thankfully rare, it’s emblematic of the road design in many places that we live, and we want to make sure that Congress gets that picture loud and clear. We want to show them that roads like Austell Road by Raquel Nelson’s apartment — 4 lane speedways with few considerations for pedestrians — are far too common. So send us your photos of dangerous, unsafe and poorly planned streets out there across America.